Aigean Networks joins the Sea Tech line. Sea Tech is proud to announce the addition of Aigean Networks line of marine Wifi antennas and routers to our offering of products. Aigean Networks was founded in 2015 with aspirations to disrupt the marine networking industry. Through the development of simplistic, feature-rich firmware running on the highest-quality hardware we are revolutionizing the way vessels connect to the internet. We have created the most simplistic networking solutions for any type of vessel. By simplifying the process of creating and maintaining complex network connections, we not only make it easy for anyone to use our products, but, in turn, give our users more time to do the things they enjoy most. All of our products are tested constantly throughout the development process, targeting specific industry-leading benchmarks. We know that what we build will perform as good, if not better, than comparable devices from other manufacturers. Additionally, every device that is built and shipped must pass our thoroughly rigorous evaluation process before it leaves our laboratory. Through extensive research and development, we have ensured that all of our products have been fabricated with the highest-quality materials and hardware available to ensure our equipment provides you with many years of extraordinary service. We stand by our commitment to reliability. Aigean Networks provides the absolute best support imaginable. Our team has more industry experience and knowledge than any of our competitors and is always willing to help. Customer satisfaction is paramount, and we do everything we can to ensure you will be an Aigean customer for life. Come see us at the 2016 Naples Boat Show! The SeaKeeper Demo Boat has Arrived! The SeaKeeper Demo boat arrived today and will be displayed at the Hamilton Harbor Yacht Club 2015 Luxury Boat Show, Saturday November 14th 1:00-4:00. The boat will be available in the area from now through the Fort Myers Boat Show as well for demonstrations. Contact us for more information. Sea Tech is pleased to announce we will be hosting the Seakeeper Demo Boat this year at the Fort Myers Boat Show! You can read through sea trial reports and watch footage of the Seakeeper in action, but the only way to truly understand how this revolutionary technology can transform your boating life forever is to take a ride and experience it for yourself! Demo rides subject to limited availability, on a first come first serve basis to qualified attendees. Please email sales@seatech.net to pre-register. Dates and times may be available in addition to the show schedule as well. Come See Us at the 43rd Annual Fort Myers Boat Show! Widely considered the premier boat show on Florida’s west coast, the 43rd Annual Fort Myers Boat Show will feature boats of just about every type imaginable, marine products and services for both enthusiasts and novices alike. Now in its 43rd year, the show will include seminars on fishing and boat safety. Local guides will be on hand to answer questions and present instruction about fishing in Southwest Florida. The show will also include a large kayaking section with daily seminars, products displays, and information about Lee County’s Great Calusa Blueway paddling trails. The U.S. Coast Guard will return this year with their interactive boating safety trailer displaying a variety of safety equipment. 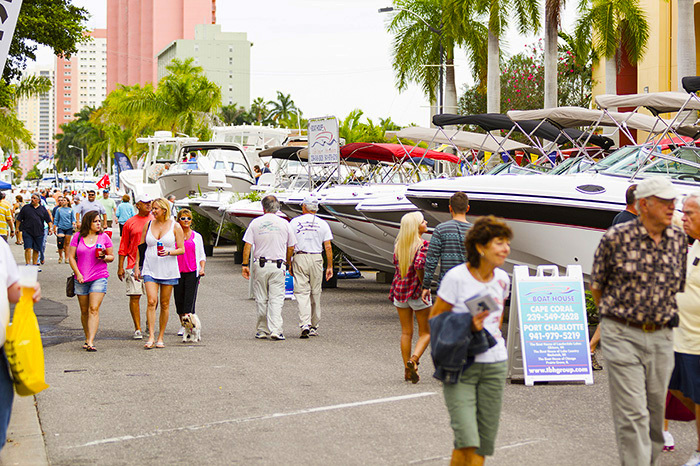 The Boat Show is located in downtown Fort Myers. The main entrance is at the corner of Bay Street and Dean Street. The show is spread out through the Harborside Event Center, along Edwards Drive and Centennial Park to The Fort Myers Yacht Basin. Admission: $10.00 per person. Children under 16 free with paid adult admission. Tickets only available for purchase at the door. Directions: From I-75, take Exit 138 (MLK Boulevard). Head west into downtown (about four miles). From U.S. 41: If you are coming from the south, watch for signs leading you into downtown just before crossing the river. From the north, take the first exit over the river and head east on 1st Street. Once in the downtown area, there are several cross streets, between Lee Street and Monroe Street, that lead to the show. Sea Tech is pleased to announce its expanded relationship with Sea Recovery. Sea Recovery, a Parker Hannifan company, has been a valued Sea Tech partner for many years, supplying state of the art watermaker systems and accessories for the marine market. As of September 1st Sea Tech will become the premier dealer for Sea Recovery in Southwest Florida, expanding its territory for sales, parts and service covering the West Coast of Florida from Tampa to Marco Island. “We are very excited about this opportunity to offer Sea Tech services to Sea Recovery customers in this expanded area” said Eric Tolnai co-owner.